This book provides an overview of dance movement psychotherapy for young people and adults with learning disabilities. Contributors from a variety of backgrounds examine their work with clients from across the disabilities spectrum, ranging from mild to complex needs. The book chapters present theory and practice relating to the client group and subsequent therapy processes. This comprises psychotherapeutic interventions, dance movement interventions, theoretical constructs, case study material, practitioner care, and practitioner learning and development related to individual and group therapy work. The logistics of a Dance Movement Psychotherapy intervention, the intervention itself and the ripples of influence into the clients’ wider socio-cultural context are discussed. This stance speaks to current research and practice discourse in health and social care. The book champions acceptance of difference and equality in the health and social care needs for people with learning disabilities whilst emphasising the importance of dance movement psychotherapy for people with non-verbal communication. 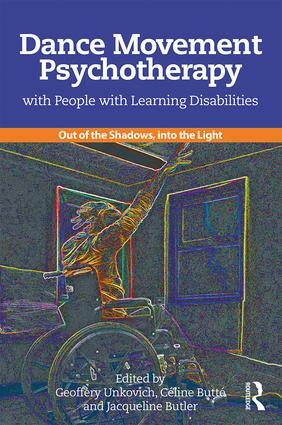 Dance Movement Psychotherapy with People with Learning Disabilities: Out of the Shadows, into the Light will provide a practical and theoretical resource for practitioners and students of dance movement psychotherapy as well as allied health professionals, service providers and carers. How can I meet Syon where he is today?